Buddha's birthday is a holiday traditionally celebrated in most of East Asia to commemorate the birth of the Prince Siddhartha Gautama, later the Gautama Buddha and founder of Buddhism. It is also celebrated in South and Southeast Asia as Vesak which also acknowledges the enlightenment and death of the Buddha. According to the Theravada Tripitaka scriptures[which?] (from Pali, meaning "three baskets"), Gautama was born c. 563/480 BCE in Lumbini in modern-day Nepal, and raised in the Shakya capital of Kapilvastu, in the present day Tilaurakot, Nepal. At the age of thirty five, he attained enlightenment (nirvana) underneath a Bodhi tree at Bodhgaya (modern day India). He delivered his first sermon at Sarnath, India. At the age of eighty, he died at Kushinagar, India. The exact date of Buddha's birthday is based on the Asian lunisolar calendars. The date for the celebration of Buddha's birthday varies from year to year in the Western Gregorian calendar, but usually falls in April or May. In leap years it may be celebrated in June. The exact date of Buddha's Birthday is based on the Asian lunisolar calendars and is primarily celebrated in Baisakh month of the Buddhist calendar and the Bikram Sambat Hindu calendar, and hence it is also called Vesak. In modern-day India and Nepal, where the Historical Buddha lived, it is celebrated on the full moon day of the Vaisakha month of the Buddhist calendar. In Theravada countries following the Buddhist calendar, it falls on a full moon Uposatha day, typically in the 5th or 6th lunar month. In China and Korea, it is celebrated on the eighth day of the fourth month in the Chinese lunar calendar. The date varies from year to year in the Western Gregorian calendar, but usually falls in April or May. In leap years it may be celebrated in June. In Tibet, it falls on the 7th day of the fourth month of the Tibetan calendar (in May). In South Asian and Southeast Asian countries as well as Mongolia, Buddha's birthday is celebrated on the full moon day of the Vaisakha month of the Buddhist calendar and the Hindu calendar, which usually falls in April or May month of the Western Gregorian calendar. The festival is known as Buddha Purnima, as Purnima means full moon day in Sanskrit. It is also called is Buddha Jayanti, with Jayanti meaning birthday in Sanskrit Language. In many East Asian countries Buddha's Birth is celebrated on the 8th day of the 4th month in the Chinese lunar calendar (in Japan since 1873 on April 8 of the Gregorian calendar), and the day is an official holiday in Hong Kong, Macau and South Korea. The date falls from the end of April to the end of May in the Gregorian calendar. As a result of the Meiji Restoration, Japan adopted the Gregorian calendar in lieu of the Chinese lunar calendar in 1873. However, it took approximately until 1945, the end of World War II, for religious festivities to adopt the new calendar. In most Japanese temples, Buddha's birth is now celebrated on the Gregorian calendar date April 8; only a few (mainly in Okinawa) celebrate it on the orthodox Chinese calendar date of the eighth day of the fourth lunar month. This section focuses on Buddha's Birthday/Vesak celebrations across Asia and beyond as opposed to East Asia only. In Bangladesh the event is called বুদ্ধ পূর্ণিমা or Buddho Purnima. On the day of proceeding Purnima Buddhist monks and priests decorate temple in colourful decorations and candles. On the day of the festival the President and Prime Minister deliver speeches about the history and importance of Buddhism and religious harmony in the country. From noon onwards large fairs are held in and around temples and viharas selling bangles, food (largely vegetarian), clothes, toys and conducting performances of Buddha's life, Buddhist music teaching about the Dharma and the 5 precepts. Later on Buddhists attend a congression inside the monastery where the chief monk would deliver a speech discussing the Buddha and the 3 jewels and about living the ideal life after which a prayer to the buddha would be conducted and people would then light candles and recite the three jewels and 5 precepts. In Cambodia, Buddha's Birthday is celebrated as Visak Bochea and is a public holiday where monks around the country carry flags, lotus flowers, incense and candles to acknowledge Vesak. People also take part in alms giving to the monks. Maybe in China, celebrations may occur in Buddhist temples where people may light incense and bring food offerings for the monks. In Hong Kong, Buddha's birthday is a public holiday. Lanterns are lit to symbolise the Buddha's enlightenment and many people visit the temple to pay their respects. The bathing of the Buddha is a major feature of Buddha's birthday celebrations in the city. The festival is also a public holiday in Macau. India is the land where the Buddha attained enlightenment (nirvana) at Bodhgaya and established Buddhism. Buddha spent majority of his life in what is now modern day India. Some of the holiest sites associated with Buddha's life include Bodhgaya (place of enlightenment), Sarnath (site of first sermon), Sravasti and Rajgir (site where Buddha spent the greater part of his monastic life and delivered majority of his discourses), and Kushinagar (site where Buddha attained Parinirvana and passed away) Under Emperor Ashoka, Buddhism spread from India to other nations. Buddha Purnima or Buddha Jayanthi in South India or Tathagata is a public holiday in India.The public holiday for Buddha purnima in India was initiated by Bhimrao Ramji Ambedkar when he was the minister of social justice  It is celebrated especially in Sikkim, Ladakh, Arunachal Pradesh, Bodh Gaya, various parts of North Bengal such as Kalimpong, Darjeeling, and Kurseong, and Maharashtra (where 73% of total Indian Buddhists live) and other parts of India as per Indian calendar. Buddhists go to common Viharas to observe a rather longer-than-usual, full-length Buddhist sutra, akin to a service. The dress code is pure white. Non-vegetarian food is normally avoided. Kheer, a sweet rice porridge is commonly served to recall the story of Sujata, a maiden who, in Gautama Buddha's life, offered the Buddha a bowl of milk porridge. 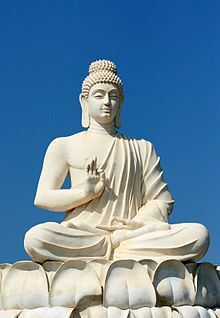 Informally called "Buddha's Birthday", it actually commemorates the birth, enlightenment (nirvāna), and death (Parinirvāna) of Gautama Buddha in the Theravada tradition. Tibetans in exile remember Buddha's birthday on the 7th day of the Saga Dawa month (fourth month of the Tibetan calendar), which culminates with Buddha's parinirvana celebrations on the full moon day. It is said that the Buddha originally followed the way of asceticism to attain enlightenment sooner, as was thought by many at that time. He sat for a prolonged time with inadequate food and water, which caused his body to shrivel so as to be indistinguishable from the bark of the tree that he was sitting under. Seeing the weak Siddhartha Gautama, a woman named Sujata placed a bowl of "Kheer" in front of him as an offering. Realizing that without food one can do nothing, the Buddha refrained from harming his own body. Thereafter, he would go on to attain nirvana. In Indonesia, Buddha's Birthday is celebrated as Waisak and is a public holiday. A large procession beginning in Mendut in Java ends at Borobudur – the largest Buddhist temple in the world. In Japan, Buddha's Birthday is known as Kanbutsu-e (Japanese: 灌仏会) or Hanamatsuri (Flower Festival) (Japanese: 花祭り) and is held on April 8. Buddha's birth is also celebrated according to the Buddhist calendar but is not a national holiday. On this day, all temples hold 降誕会 (Gōtan-e), 仏生会 (Busshō-e), 浴仏会 (Yokubutsu-e), 龍華会 (Ryūge-e) and 花会式 (Hana-eshiki). Japanese people pour ama-cha (a beverage prepared from hydrangea serrata, a variety of hydrangea) on small Buddha statues decorated with flowers, as if bathing a newborn baby. The tradition of bathing the Buddha originated in China and was introduced to Japan where it was first held in Nara in 606. Lion dancing is also a major tradition practiced during Buddha's Birthday and has become associated with the festival in Japan. In Malaysia, Buddha's Birthday is celebrated as Wesak Day and is a public holiday celebrated by the sizeable minority Buddhist population in the country. Temples across the country are decorated and caged animals are set free. People engage in prayers, chanting and giving across the country. In Mongolia, Buddha's Birthday is celebrated as Ikh Duichen and its date is determined by the Mongolian lunar calendar. 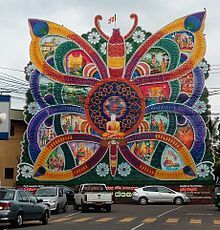 As a result, the date falls in line with celebrations of Buddha's Birthday/Vesak in South and Southeast Asian countries as opposed to neighbouring East Asian countries. While not a public holiday the festival is popularly celebrated by many Mongolian Buddhists. In Myanmar, Buddha's Birthday is celebrated as Full Moon of Kason and is a public holiday. It is celebrated by watering the Bodhi tree and chanting. In large pagodas music and dance is also performed as part of the celebrations. In Nepal, the birthplace of Buddha, his birthday is celebrated on the full moon day of May. The festival is known by various names, Buddha Jayanti, Buddha Purnima, Vaishakh Purnima, Saga Dawa, and Vesak. Purnima means full moon day in Sanskrit. Among the Newars of Nepal, especially from the Shakya clan of Newars, it is of great importance because they consider it as a continuation of the sage of the Śākyas- the clan that Lord Buddha's family belonged to. Thus, they celebrate the festival which is in their language known as Swānyā Punhi (स्वांया पुन्हि), the full moon day of flowers. The day marks not just the birth of Shakyamuni Gautam Buddha but also the day of his Enlightenment and Mahaparinirvana. The event is celebrated by gentle and serene fervour, keeping in mind the very nature of Buddhism. People, especially women, go to common Viharas to observe a rather longer-than-usual, full-length Buddhist sutra, as something like a service. The usual dress is pure white. Non-vegetarian food is normally avoided. Kheer, a sweet rice porridge is commonly served to recall the story of Sujata. Buddha Purnima is biggest day for Buddhist because on this day there happens to be the main three events of Buddha's life; birth, attained enlightenment and attained Paranirvana ,and is termed as Thrice Blessed Festival. Buddha's Birthday is occasionally designated as a public holiday in North Korea and is known as Chopail (Korean: 초파일). Designation of traditional Korean holidays as public holidays in North Korea are determined by the Cabinet a few days before the traditional holiday begins. Buddha's Birthday is a traditional festival in Korean culture and was celebrated in Korea long before the division of the country as a result the festival is also celebrated in North Korea by the country's Buddhist population. Around 2% of the population in the Philippines is Buddhist. Buddha's Birthday celebrated as Vesak (Tagalog: Araw ng Bisyak) is not a public holiday but is celebrated by the small community of Buddhists in the country. The bathing of the Buddha statue is a significant part of the celebrations in the country. In Singapore, Buddha's birthday is celebrated as Vesak or Vesak Day and is a public holiday in the country. Buddhist temples hold celebrations and are decorated with Buddhist flags and flowers. Devotees also bring offerings to the temples. In South Korea, the birthday of Buddha is celebrated according to the Korean lunar calendar and is a public holiday. This day is called 석가탄신일 (Seokga tansinil), meaning "Buddha's birthday" or 부처님 오신 날 (Bucheonim osin nal) meaning "the day when the Buddha came". Lotus lanterns hang in temples throughout the month and lanterns are hung in homes and in the streets. On the day of Buddha's birth, many temples provide free meals and tea to all visitors. The breakfast and lunch provided are often sanchae bibimbap. Buddha's Birthday is a popular holiday and folk celebration in Korea and is often celebrated by people of all religious beliefs. In Sri Lanka, Buddha's Birthday is celebrated as Vesak and is a public holiday celebrated on the first full moon day of the month of May. Its date is determined by the Buddhist lunar calendar. People engage in religious observances and decorate houses and streets with candles and paper lanterns as well as bamboo-framed lanterns. Dansalas is practised and refers to the free offering of food and drink to people. Bakthi Gee – devotional songs are sung and pandols which are decorative gateways are erected throughout the country. Temples around the country also hold celebrations and devotees bring offerings and burn incense. 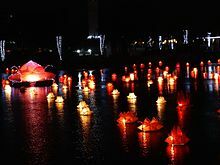 Electric light displays that depict stories from the Buddha's life are also a notable part of Vesak celebrations in the country. In Taiwan, Buddha's birthday is a national anniversary. Devotees pour fragrant water over Buddha statues to symbolise the beginning of a fresh start in life. In Thailand, Buddha's birthday is celebrated as Visakha Puja and is a public holiday. People gather at temples to hear sermons, give donations and chant prayers. On the Australian external territory of Christmas Island, Buddha's Birthday is celebrated as "Vesak Day" and is celebrated alongside many other celebrations common in Australia and Malaysia as well as local celebrations of the island. Vesak (Hanamatsuri) is widely known and celebrated in Brazil due to the country's large Japanese community. Hanamatsuri has grown in popularity and also attracts interest from the wider non-Japanese Brazilian population. As a result, Hanamatsuri has become a consumerist culture phenomenon in the country and is sometimes locally known as Festa das Flores. Hanamatsuri is celebrated in the São Paulo neighbourhood of Liberdade which is home to the largest Japanese community outside of Japan. Hanamatsuri celebrations in Liberdade began in 1966 and includes a parade on Galvão Bueno street and celebrations at the suburb's major shopping centre, Liberdade Plaza, among other things. In Toronto, three Buddhist temples representing the three main branches of Buddhism organize an annual event known as Vesak: Buddha's Birthday. It is held at Mississauga Celebration Square and features a number of Buddhist themed events and activities as well as cultural acts from Asia, including China, Sri Lanka and Vietnam. ^ UNESCO, Lumbini in Nepal is the birthplace of the Lord Buddha, Gethin Foundations, p. 19, which states that in the mid-3rd century BCE the Emperor Ashoka determined that Lumbini was Gautama's birthplace and thus installed a pillar there with the inscription: "... this is where the Buddha, sage of the Śākyas (Śākyamuni), was born." ^ For instance, Gethin Foundations, p. 14, states: "The earliest Buddhist sources state that the future Buddha was born Siddhārtha Gautama (Pali Siddhattha Gotama), the son of a local chieftain—a rājan—in Kapilavastu (Pali Kapilavatthu) what is now the Indian–Nepalese border." However, Professor Gombrich (Theravāda Buddhism, p. 1) and the old but specialized study by Edward Thomas, The Life of the Buddha, ascribe the name Siattha/fitta to later sources. ^ Prasoon, Shrikant (2007). Knowing Buddha Life and Teachings. ISBN 9788122309638. ^ Hulsbosch, Marianne; Bedford, Elizabeth; Chaiklin, Martha (2009). Asian Material Culture. ISBN 9789089640901. ^ Dunipace, Sujal Jane (May 2003). "Nepal's Buddha Jayanti Celebration". ECS Nepal. Archived from the original on 18 December 2011. Retrieved 9 May 2013. ^ a b Understanding North Korea: Totalitarian dictatorship, Highly centralized economies, Grand Socialist Family. 길잡이미디어. 2015. p. 385. ^ Encyclopedia of Korean Seasonal Customs: Encyclopedia of Korean Folklore and Traditional Culture Vol. 1. 길잡이미디어. 2014. p. 147. ISBN 978-8992128926. ^ a b Encyclopedia of Korean Seasonal Customs: Encyclopedia of Korean Folklore and Traditional Culture Vol. 1. 길잡이미디어. 2014. p. 150. ISBN 978-8992128926. ^ "Buddha's Birthday Education Project". International Buddhist Progress Society. Retrieved 12 January 2014. ^ "Buddha Birthday Festival". Buddha's Light International Association, Chung Tian Temple. Archived from the original on 26 January 2014. Retrieved 26 January 2014. ^ "Buddha's Birthday and Multicultural Festival". Buddha's Light International Association Victoria. Retrieved 31 March 2014. ^ Dessi, Ugo (2016-07-01). The Global Repositioning of Japanese Religions: An integrated approach. ISBN 9781317030126. ^ a b Negawa, Sachio (11 October 2007). "Chapter 8: The Formation and Development of Bairro Oriental (3) - The Emergence of a New "Tradition"". Discover Nikkei. Retrieved 17 February 2018. ^ a b "Hanamatsuri". CulturaJaponesa.com.br. Retrieved 17 February 2018.